Taco Tuesday. It just has a nice ring to it, don’t you think? 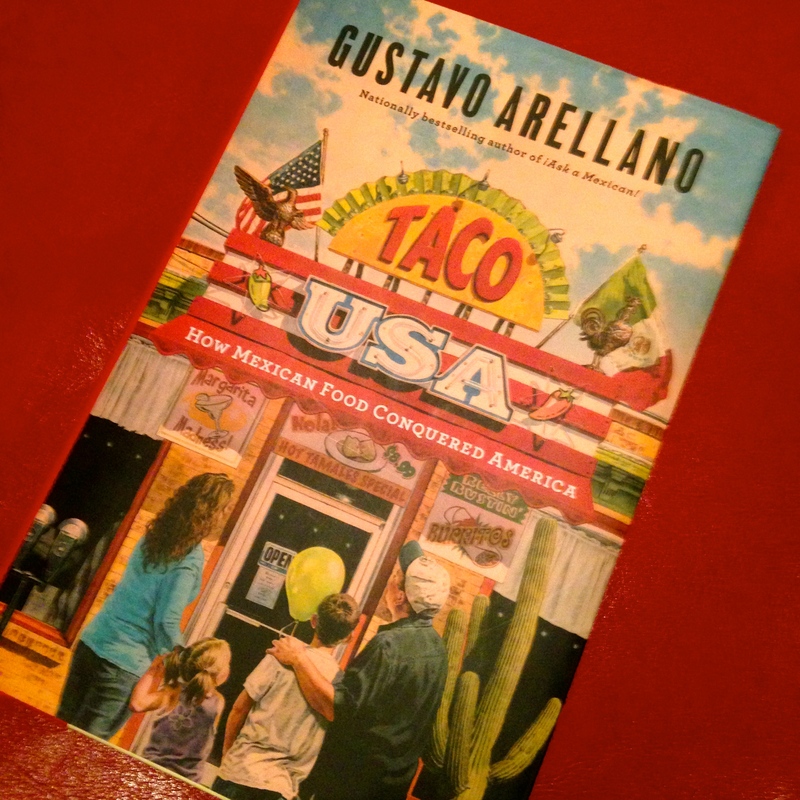 According to Gustavo Arellano, author of the book Taco USA, How Mexican Food Conquered America, a number of restaurants claim the original idea – one even copyrighted the term. No matter who thought of it first, I think it’s a great idea. And not long ago I had an inadvertent (but delicious) Taco Tuesday I won’t soon forget. The scene was Jackson, the capital of our fine state. For the purposes of my day job, which is medical in nature, I found myself spending the day at the Medical Mall. Until 24 hours before my trip, I didn’t even know there was a Medical Mall. For others unfamiliar, it’s an old shopping mall, retrofitted with clinics, pharmacies, health education and the like. Not necessarily the sort of place you’d think would harbor a great lunch spot. But pharmacists gotta’ eat, right? When lunchtime came, my colleague gave me a quick tour of what served as an extended food court: Subway of course, because the next closest Subway must have been at least a half mile away. (I’m convinced they have the same expansion plan as Dollar General.) Chick-Fil-A in miniature (not a full-size restaurant – more like a stall with sack lunches.) And Picadilly Cafeteria, an apparent holdover from mall days, I’m betting. There were a few other places scattered about, but the one that caught my attention was a little kiosk halfway between Subway and Picadilly. The sign said, “Sameerah’s Healthy Kiosk.” A bigger sign listed five or six varieties of grits: grits with bacon, grits with ham, grits with sausage, etc. The idea of grits for lunch brought me back, but when I looked at the menu – abbreviated but intriguing – it was a taco that sealed the deal. 3)I don’t know if I’ll ever get the chance to go back. The struggle is real. Thankfully, there was another customer waiting for his order that was happy to help. I didn’t get his name, but I did get that he worked in the building. I also got that he had eaten with Ms. Sameerah every day, Monday through Friday, since something like January. He also revealed that she made everything fresh daily – if she ran out, she ran out. She even cut her veggies right there in front of us. I watched her shave slices of carrot right into our wraps. In the end, though, he wasn’t as much help as I had hoped: he had tried everything on the menu, and it was all good. I was right back where I started. 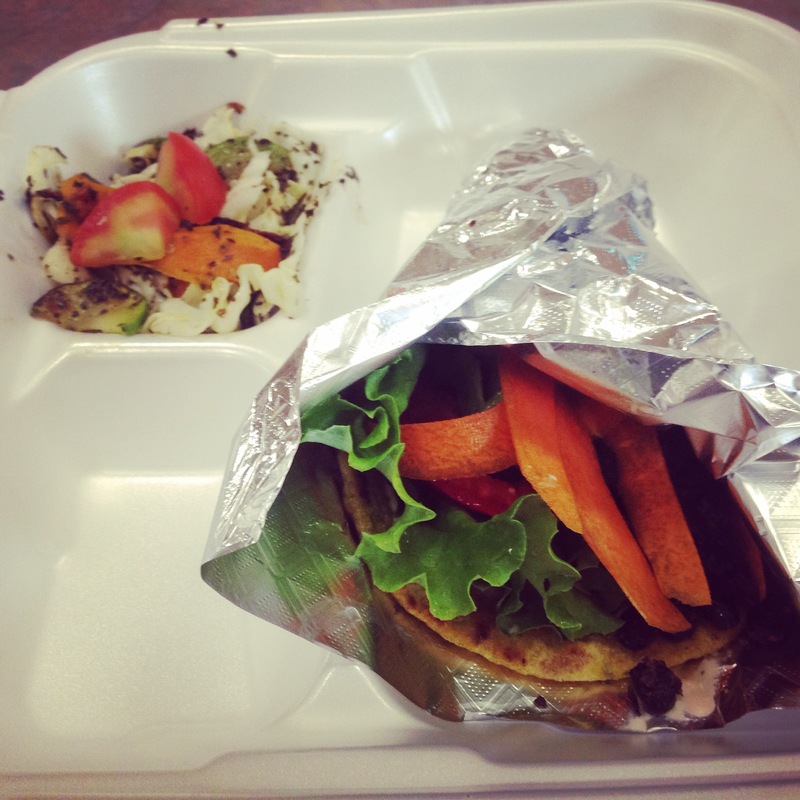 I finally settled on the black bean taco – it was a healthy kiosk, after all. She cut the veggies fresh, after all. Plus it was after 2 o’clock and I knew I’d be eating dinner in a few hours, so something lighter seemed the right thing to do. She started with one of her homemade wraps. I didn’t get details on how she made it, but I could see that it was special – chances are it was a secret, anyway. The next layer was something she called Sameerah Sauce – no secrets divulged on that one, either. Next she added black beans heated on the electric griddle, then fresh-cut carrots, tomatoes, lettuce, avocado, and more. Another squirt of Sameerah Sauce and it was done. Simple and delicious. On the side were grilled veggies unlike any I’ve ever had. Thin-sliced cabbage, green pepper, tomato, onion, and zucchini – heated up on the griddle with a blend of herbs that I assumed she wouldn’t share. (And she wouldn’t share.) I’ll just have to experiment and figure it out, because those veggies were ten times better than any side of fries. And healthy to boot. Lunch was a lucky surprise, but dinner had already been decided. I left the Mall after work and went a few minutes down the road to Fondren for my first visit to the Pig & Pint. As I approached the entrance, I was enthusiastically welcomed by one of the P&P servers. I told him I’d never been there before and requested his recommendation. Ribs were his first thought – apparently they’d won an award for being the best in Jackson. Next on his list was the taco sampler. Now he had my attention. I think it’s ironic that a dish most old-school pit masters would never have offered in a roadside barbecue joint is now de rigueur in the newer places. And despite the purist streak in me, I dig ‘em. But I did take the time to peruse the menu. I had already heard about the pork belly corn dog. I was intrigued by the pimento cheese served with house made pork rinds. Boudin burger? Ordinarily I would have gone for it (I’m odd like that) or at least persuaded someone with me to order something different. That allows me to pretend to be a real food critic and try as many dishes as possible. But alas, I was alone and not quite starving, so I went with my gut and got the tacos. 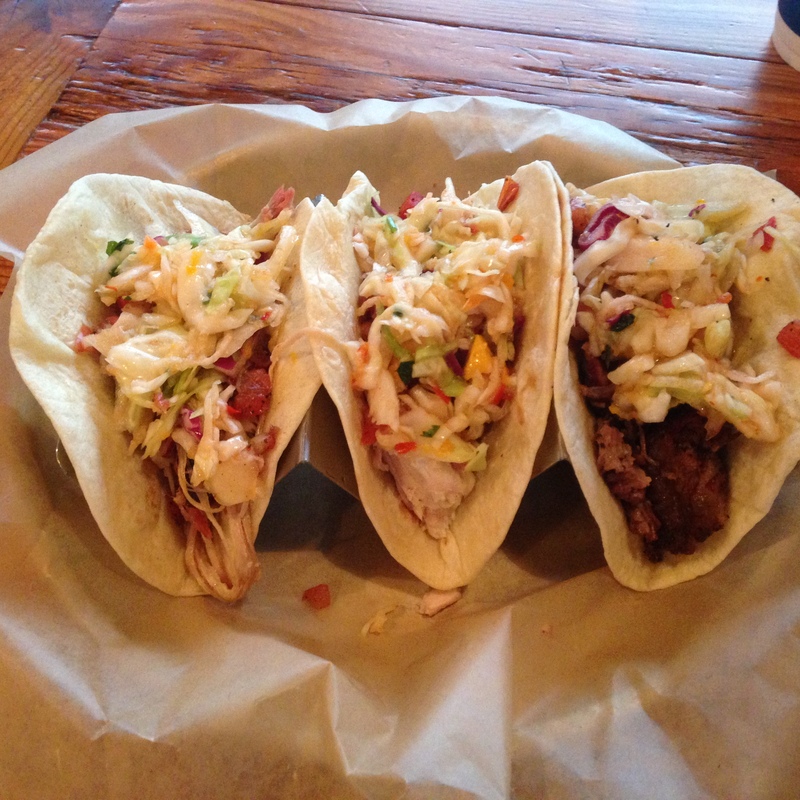 The trio included one each with pulled chicken, pulled pork, and brisket. All had pico de gallo and mango jicama slaw, the slaw another rendition you are unlikely to find at a typical joint – yet it fit right in at the Pig and Pint. I think the brisket was my fave, but I didn’t leave a crumb from any of them. 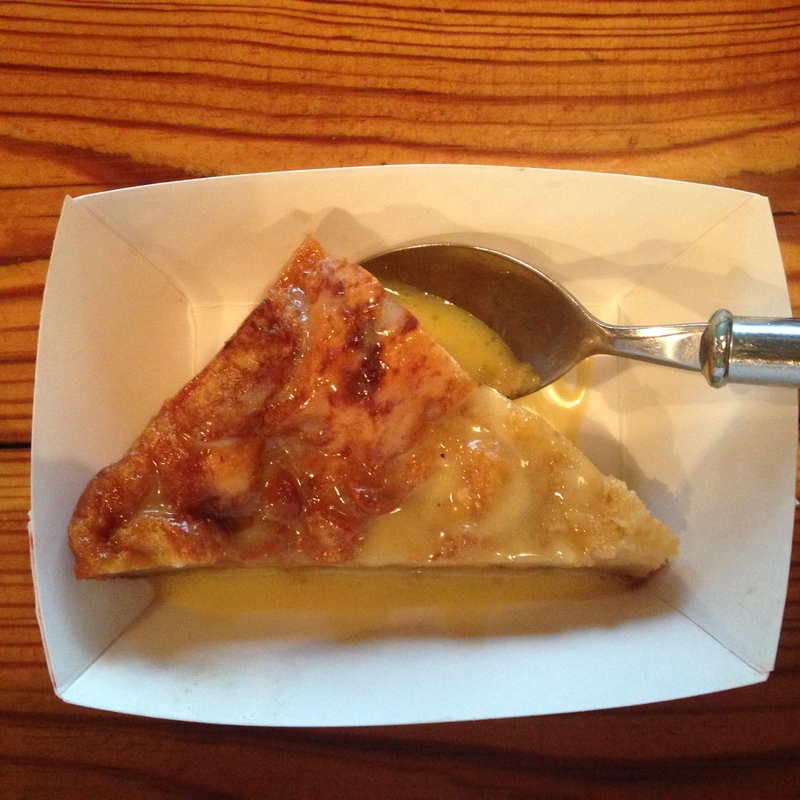 And despite my state of satiation, I geared up for the ride home with a decadent chunk of Parker House Bread Pudding, infused with cranberry jelly and covered in white chocolate sauce. A long workday transformed into an unforeseen Taco Tuesday. That’s the kind of day I like.